Thomas James Hankinson moved to Bournemouth in 1858 and set up business in real estate, as a stationer publisher and estate agents. In 1873 he was elected to the Board of Commissioners and he became the first mayor in 1890. 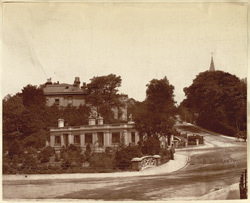 The photograph shows his offices at Richmond Hill, Bournemouth.